As we inch towards our centenary in 2021, the following piece, based on an article published for the Club's 75th anniversary in 1996 makes interesting reading. It seems that we've been doing what we're doing for a long time. On May 24th 1921 Flushing Sailing Club came into being at a public meeting in Flushing village hall. Four days later the first races took place! There were only two classes for small working boats of 15 and 17 feet LOA. During this period there were a large number of this type of boat since they not only serviced the busy commercial port but also assisted a considerable fishing fleet. Yacht racing at the time was largely a sport for big boats crewed by paid hands and many men from Flushing and Falmouth found summer employment in this field. Apparently the club was formed to provide racing for residents of Flushing and considerable interest was shown in those early regattas. 1922 saw two extra classes introduced for all-comers in order to cater for increasing entries from Falmouth boats. The biggest boats still only boasted 18 feet LOA and race entry fees amounted to two shillings and sixpence per race! * Since then, the club has raced every Saturday throughout each season with the exception of the War years: racing resumed in 1946. In 1947 prompted by the then current ‘Double Summer Time’ perhaps, the first series of Tuesday evening races were held and these too have been part of the regular programme. The club has responded to an ever changing demand over the years and provided racing for a variety of classes. These include working boats of all classes and definitions, Sunbeams, Mirrors, Yachts of ‘up to 20 tons’, West of England Redwings, International 14's, Hornets, 8 Metres, Troy, YW Cadets and many others. Some are still going strong whilst others have sunk into obscurity. For instance who can tell us anything about the Zola O.D. circa 1947? One things for sure, classes may come and classes may go but today, as in 1923, they still argue about one vexing thing – handicaps! Prior to 1948 the Club had no headquarters. 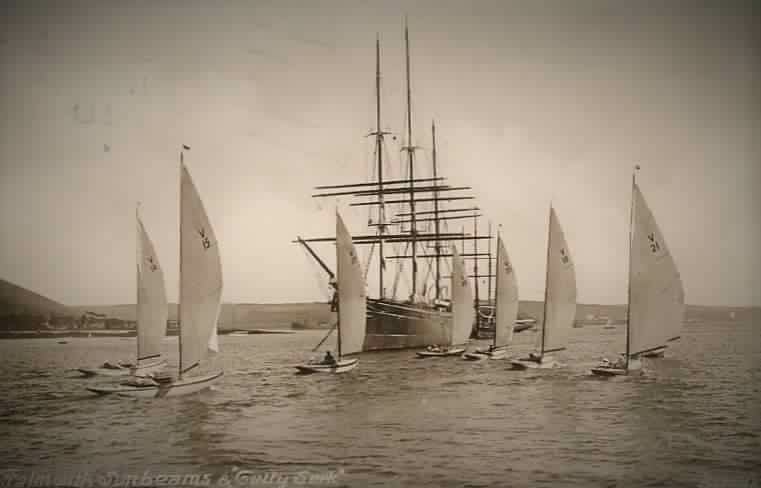 Racing was carried out from a small building on the new Quay and Club meetings, prize giving etc. were held in the village hall. In 1948 the then Commodore, Mr H.J. Silley of The Falmouth Docks Company, gave the Club a small steam vessel but without an engine. Only the wheelhouse was usable and this was used as a starters’ hut and store. After two years it was realised that the maintenance of the boat was too much and she was sold. The Club then moved to the Lawncliffe Hotel, Flushing, where the proprietors provided two rooms and a bar and this remained the Club’s headquarters until 1959. 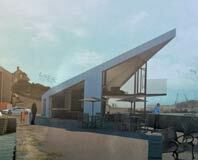 In January of that year work commenced upon a new Clubhouse on the New Quay, and this is where it all started. The Club was extended in 1966 and again in 1975, with further improvements made recent years and we are still here. Not large, not grand, but comfortable with a welcoming atmosphere, and still dedicated to providing good racing. *It is hard to estimate the likely income around this time, but labourers were paid about 15 shillings (75p per day). That makes individual race entries about one sixth of a daily wage. Proportionately, current race entry fees are much less. A bargain. Eight ‘Falmouth’ Sunbeams and the Cutty Sark (off Kiln Quay?). Date unknown.